The baby is in the high chair and you cover her snack with a bowl. 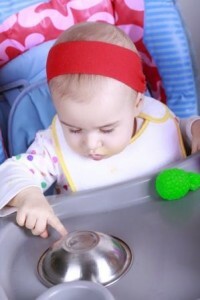 Does she look under the bowl to find her goldfish crackers? Or maybe she drops her green ball on the floor. Does she look for it? Or does she just cry because her snack or favorite toy has disappeared? The challenging part about developing object permanence is that, when a baby realizes that his parent still exists when he can’t see her, he can get upset. This is what happens with separation anxiety. Playing these games can help a baby as he moves through this other very natural milestone. Object permanence games help babies understand that even though I can’t see my mom, she will come back! Playing with babies is fun 😉 I think baby’s childhood is a period parents enjoy the most. But playing different games with babies is a tough job too. One need to come up with various ideas to get small kids engaged and make them happy. And while playing with them parents can also teach them many things. A page “When and How Your Baby Learns About Object Permanence” on WhatToExpect is very interesting and useful regarding this. I hope others also enjoy reading this article. Thanks for the suggestion, Deslyn!